I'm planning my garden for next year and have gotten fussy about all the space tomatoes need in my little plot. Topsy turvy tomatoes seem to be the answer. It would be great to free up the room for other veggies. However, after reading previous comments in this forum I'm inclined to again plant them in the ground next year, but my Jury is still out.... I'm keenly interested in hearing what other folks would say about the TT tomato method! A question along the same line: what does one do with the bucket that TT's are grown in when the season has ended? Are they recyclable or do you just pitch 'em? Thanks for your replies! I have to agree, I have never seen one do well, even before the "Topsy Turvy" thing, folks would drill a inch diameter hole in a 5 gallon bucket, doin the same as the fancy planter, and no, I still didn't see a harvest worth the time and effort. the usual answer to "Why my TT did not do well" is use a smaller variety..
yet, I have had knowledgeable gardeners who tried Patio types, that do well in pots, fail miserably when grown upside down..
and as lilinater said...I too have only seen death or disappointment. Several were given to me because my friends know I love tomato plants. I decided it might be good to try them out and evaluate their utilization as a good substitute when I get too old to effectively do much physical gardening. It was a difficult year for Vermont tomatoes because of both early and late blights. However, I still did reasonably well most of my plants (60) except the darn TT's. This one year experiment with them was enough for me. All I have heard about the commercial "Topsy Turvy" system is bad. The problems I've heard about start with the cheap quality of the container as well as the small size. 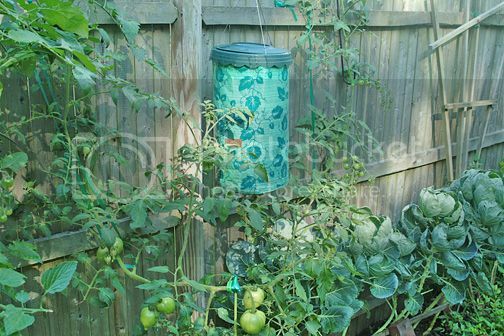 I have read some reports from people who use the system in containers of their choice such as five gallon buckets or regular hanging baskets. They simply cut or drill holes in the bottom of the container, put the plant in upside down, put something soft around the plant stem to contain the soil, and fill it with good soil. Most reports I've read indicate good results with the upside down tomatoes but most say it is only a novelty and not a serious gardening effort.